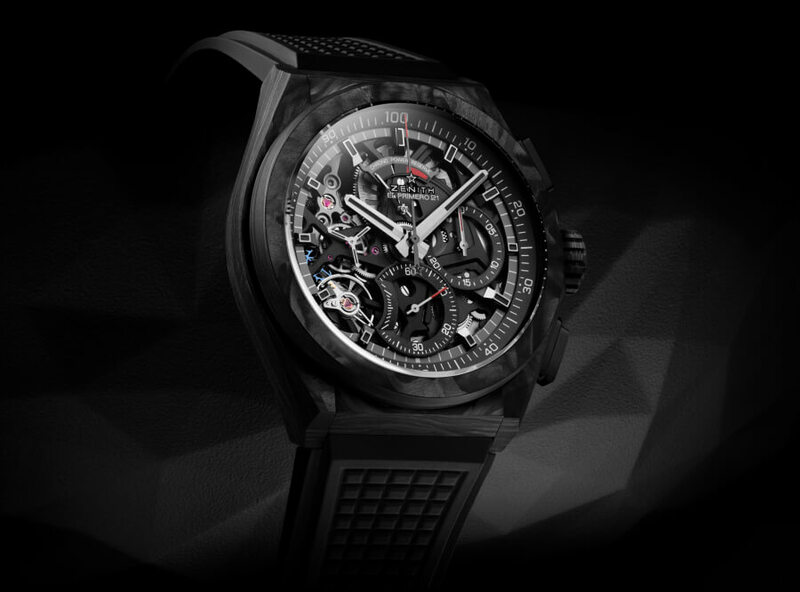 A chronograph wristwatch at the pinnacle of precision, the Zenith DEFY El Primero 21 is equipped with a revolutionary movement that marks the 21st century chapter of the El Primero chronograph calibre’s enduring legacy, once again raising the bar in performance in a uniquely styled package. 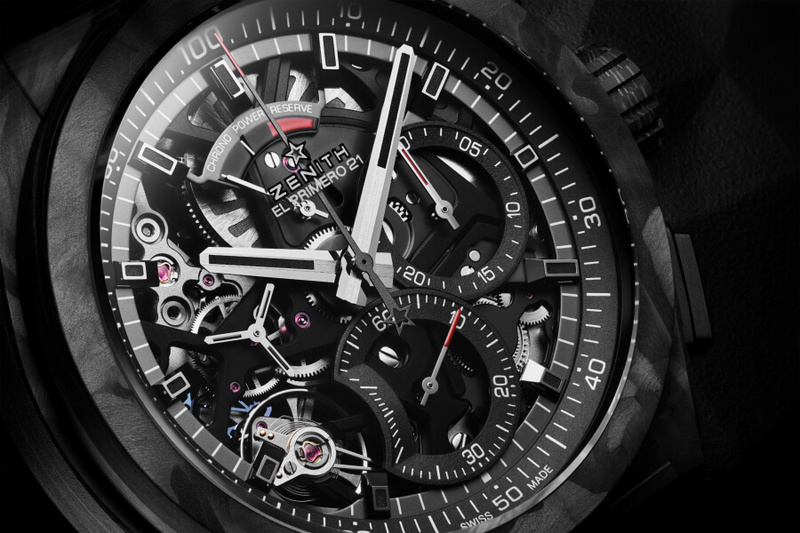 Now, the futuristic chronograph comes in its most outstanding iteration to date: DEFY El Primero 21 Carbon. There’s something truly inimitable about carbon fibre. The high-tech composite material is lightweight yet extremely durable. It makes a statement while remaining subdued. 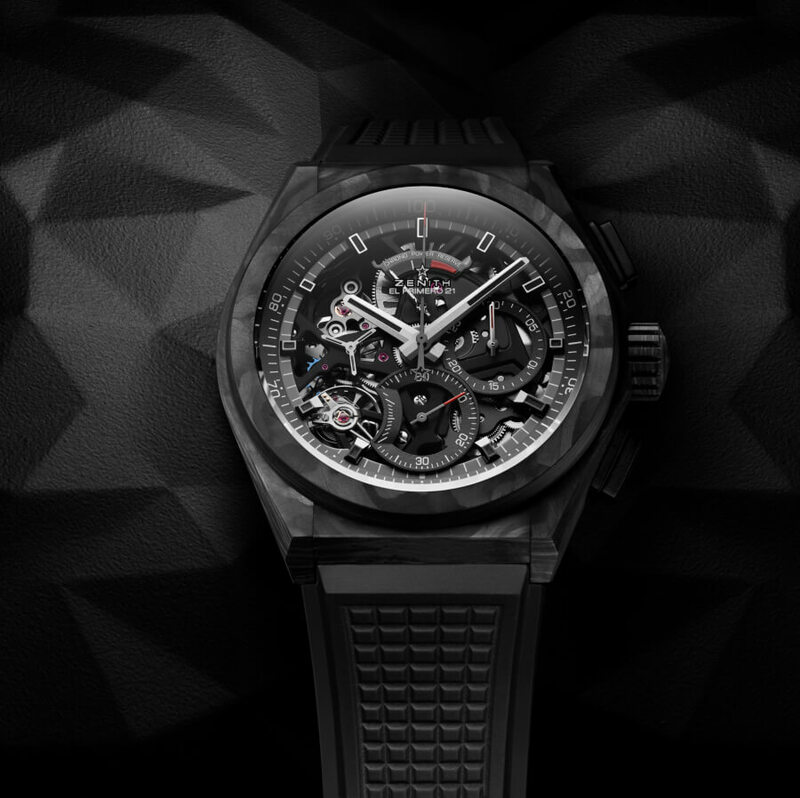 It plays with light and reveals a unique visual effect caused by the alternating layers of carbon fibres that are randomly arranged, making each case essentially unique. 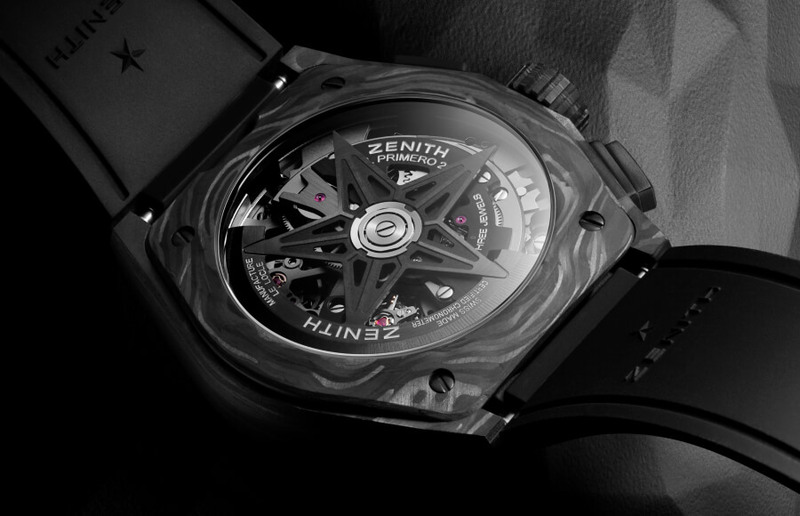 Its captivating visual effect is stealthy and edgy at once, giving the material a versatile and easily wearable aspect. And with this version of the DEFY El Primero 21, it’s not just the faceted case and round bezel that are forged from carbon, but also the crown and chronograph pushers. Completing the ergonomics of the DEFY El Primero 21 Carbon is a choice of two straps: a black textured rubber strap, and a special rubber strap with a carbon effect for the ultimate urbanite look. With a case as otherworldly as carbon, it’s only natural that the movement and dial are made to match its mysterious allure. 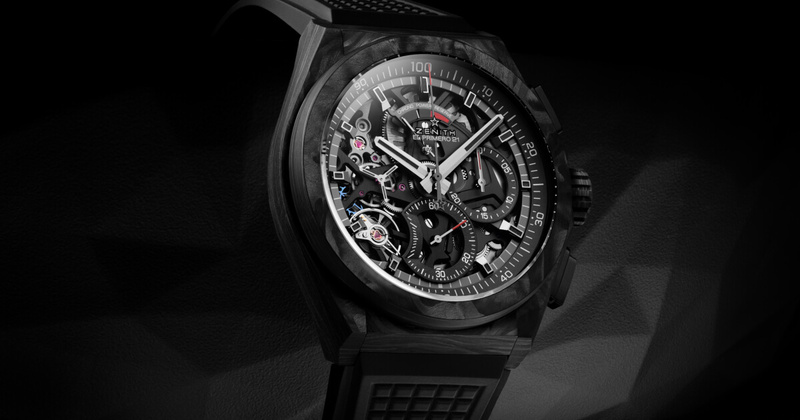 For the first time in the DEFY El Primero 21, the cutting-edge 1/100 second chronograph calibre operating at a phenomenal and unrivaled rate of 360’000 vibrations per hour (50 Hz) is given a deep black treatment, allowing the gleaming edges of the innovatory skeleton movement to shine through the dark. The open dial is also black, yet remains effortlessly legible with its contrasting white markings. The hour, minute and constant seconds hands, like the applied hour markers, are faceted with a dark ruthenium coating and filled with black SuperLuminova that gives off a subtle glow in the dark. 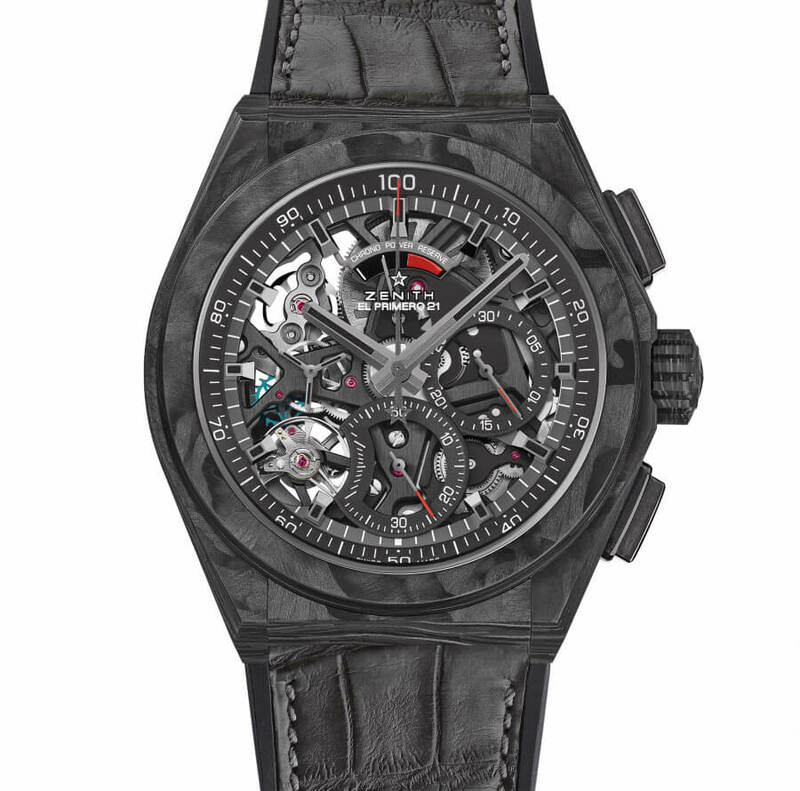 Keeping the emphasis on its unrivaled high-speed chronograph function, the central 1/100 second hand and seconds and minutes totalisers have blackened hands with bright red tips. A look that embodies Zenith’s neo-futuristic, architectural design ethos to create the timepieces of tomorrow for the style-conscious watch aficionados of today. 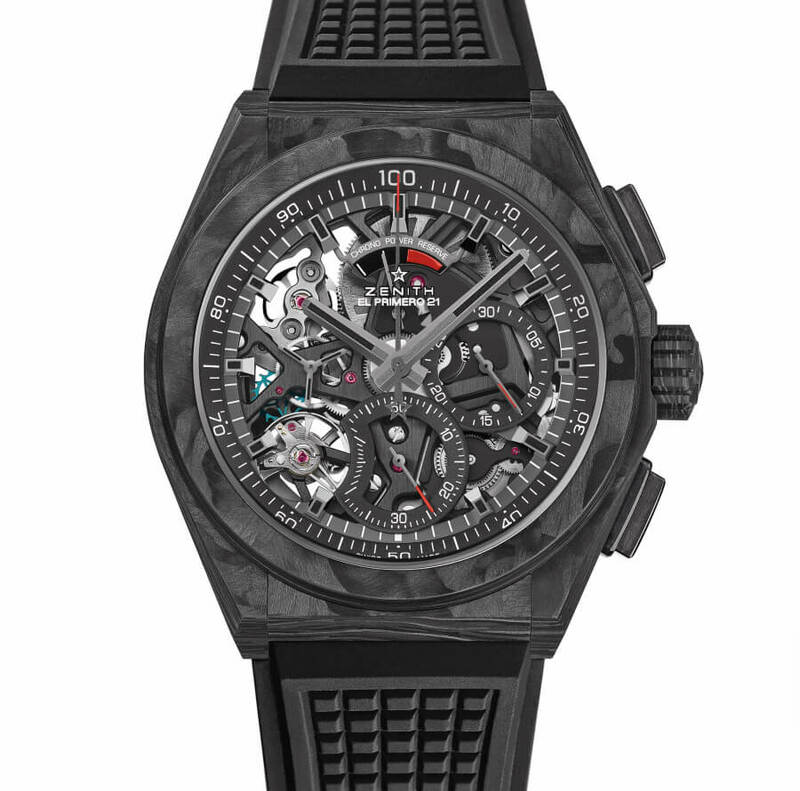 The price for the Zenith Defy El Primero 21 Carbon is CHF 18,900.